The all time favorite Mr. Potato Head is just NOT a toy but can be used as a learning tool on many different levels!! This is one of my favorite toys to use in producing speech and language! You can use this to teach so much: colors, simple phrases, body parts, asking questions and more! How can I use this in therapy? zipped and have students request to open the bag or ask for help. on the table and ask the child to find the eyes, nose, etc. red hat?" "Who has the purse?" and the students will answer "I do"
skills lesson as asking questions is difficult for students to learn! You can use Mr. Potato Head as a class wide behavior management tool. When I thought of this idea the best part about it as it is visual and students can see the end goal in sight! 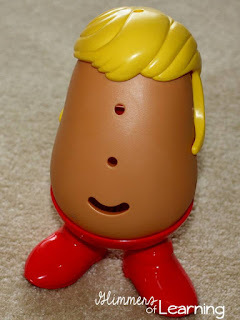 Throughout the day or week as the class behaviors appropriately add another piece to the Potato Head. You can even display the pieces that are not on the Potato Head yet to encourage them to keep working hard! Once they have completed the Potato Head the class earns some sort of reward (extra reading time, extra recess, free play, etc). I hope if you don't already have a Mr. 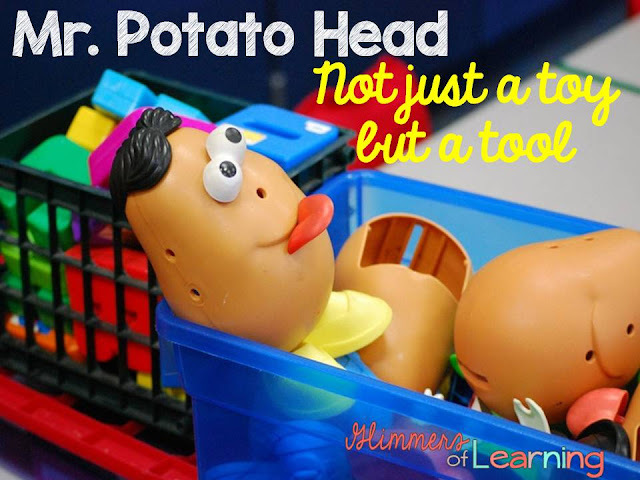 Potato Head in your classroom I hope that you go out and pick one up! I know I will be on the look out for extra parts at garage sales this summer! I checked out E-bay and you can get a TON of parts for a great price! !